(Nanowerk News) Terahertz radiation (THz) has unique characteristics with the potential to provide the basis of new imaging techniques for detecting and diagnosing cancer and other medical conditions. Moreover, because the energy of the photons that carry THz radiation is around 100,000 times less than that of x-rays, it is expected to be much safer. Unfortunately, the efficiency of devices built to detect THz radiation has been poor. This is because the frequency of THz radiation is too high to be handled by microwave electronic circuits, and its energy is too low for conventional optoelectronic devices. 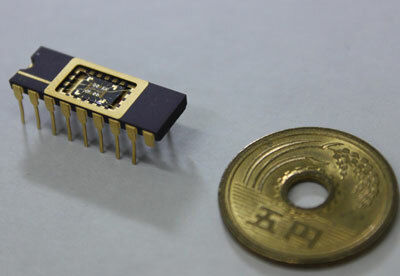 By combining several advanced device concepts, Yukio Kawano and colleagues of the RIKEN Advanced Science Institute, Wako, have succeeded in building a highly sensitive THz detector (Fig. 1) that is capable of sensing just a handful of THz photons at a time ("Terahertz sensing with a carbon nanotube/two-dimensional electron gas hybrid transistor"). Practical sensing devices must perform two key tasks: absorb the radiation they are trying to detect, and then react to this absorption in some measurable way. These tasks are usually performed by a single component of a device. Kawano and colleagues’ device, however, performs them with two different components. One component, a structure known as a two-dimensional electron gas (2DEG), absorbs THz radiation. A 2DEG is a thin layer of electrons that are confined between two different semiconducting materials—in this case, GaAs and AlGaAs—but are free to move within the layer. A 2DEG is highly conducting and therefore highly absorbing of THz radiation. On top of the 2DEG, the researchers built a carbon nanotube single electron transistor—a device that behaves like a switch with electrical characteristics controlled by the presence or absence of individual electrons in its channel. They found that when the 2DEG beneath this transistor absorbed a burst of THz radiation, it shifted the voltage at which the transistor switched. At the lowest levels of radiation, they also observed intermittent switching behavior known as telegraph noise, suggesting that only a few photons were needed to induce switching. As well as achieving unprecedented detection sensitivity, the device operates at temperatures much higher than most previously demonstrated detectors. This means it needs much simpler refrigeration techniques, making it cheaper and easier to use in practical applications. “Our detector, having the ultimate sensitivity, could be used as a powerful tool in fields such as nanomaterials, bioscience and astronomy where important information is expected to be concealed in the THz region,” says Kawano.